Every girl knows that the month before her boyfriend’s birthday is a busy one because there is much to do and little time to do it. This is because they devote so much time thinking about what to get him, how to surprise him and how to make him smile throughout the whole day. Dare to make him happy and take care that nothing and no one is able to interfere with his happiness. Apart from the details and gifts you can give him, for him it will also be very nice that you express your feelings, your desires in his birthdays and the great love you have for him. Sometimes words are gone with the wind and we cannot treasure them, so we thought it could be better for you to transfer your feelings into phrases so that he can then save and read them as often as he might want to do so. 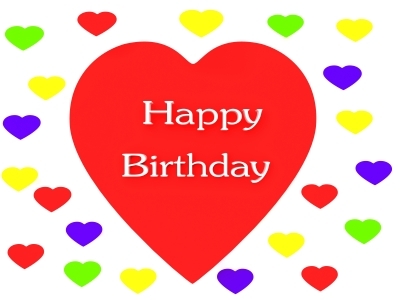 As follows, you will find the most beautiful birthday phrases to share with your boyfriend on his birthday. :: “Hello sweetheart. It gives me great joy to see that you are waking up because today is a beautiful day and we cannot waste a single minute. Let us thank the sun for being so radiant, illuminating everything and tinting it of a golden color that I know you love. Now I want to see you smile because when you smile, I go crazy. I beg the Lord to always give you His blessings and to give me the opportunity to be with you at all times and in all places. Have a nice day”. 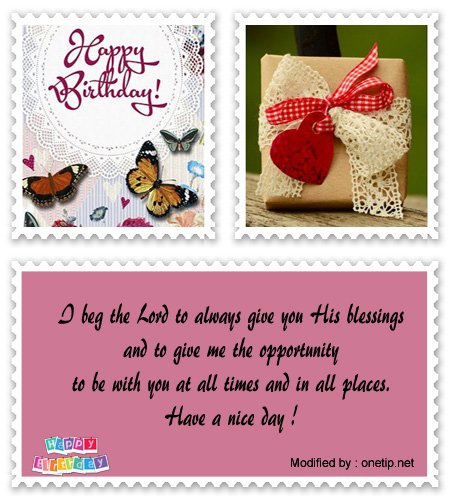 :: “The day of our birthday we must be surrounded by all the people who appreciate us and who loves us. I hope you know, deep in your heart, that no one loves you as I do, because to me you are the most special man on the face of the Earth. 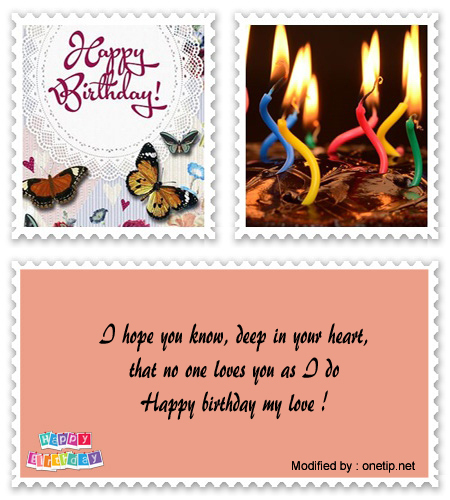 I love you very much and I want you blow out the candles for you to try the cake that I made especially for you”. :: “Several years ago, you came to this world and since then we celebrate your arrival with all the joy that can exist, because you came to change the lives of everyone, including me. This and all the days of your life are cute, like you. Happy Birthday, sweetie”. :: “Honey, have a nice day. I already want to know what is going to be your wish when you blow the candles; you know I am a very curious person and I will not stop until you tell me what you asked for. I cannot wait to kiss you and hug you with all the affection that I keep in my heart. I love you, happy birthday”. :: “You are one of a kind, I have no doubts of that and I also wanted you to know so. You have a gift to make everyone who interacts with you happy, and that I feel that is a great feature of your personality. Thanks for being you, for giving me your days and receiving mine. May you have a beautiful day, my love”. :: “You came to this world and time stopped, things were no longer as before and a new timeline was created, one in which you were the only one who existed and where nothing else needed to be created. For me, you are my life, the beginning and the end; you are everything. 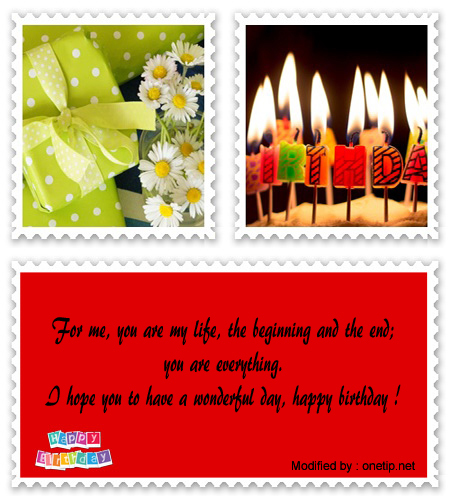 I hope you to have a wonderful day, happy birthday”. :: “You open your eyes and it all starts, because today the day was not going to start until you woke up and you gave permission to start celebrating your day like you deserve it. You impress me every day, and do not cease to amaze me. I love you from here to heaven and back. Happy birthday, love of my life, do not ever change, because I would not stand it. I adore you”. There will be nothing better for him than to receive a phrase full of feelings from you. Be assured that he will love reading everything you feel for him and your good wishes on his birthday, because it is a special moment full of emotions. Remember that things and material stuff are not everything, which is a great reason to accompany your present with a phrase as the ones we provided you. See you soon and know that we are always updating the content we offer, so come back anytime. Good luck! When your boyfriend’s birthday arrives, you get eager to express all the great affection you feel for him and wish him all the best. He always makes you feel like a princess and cherishes you with many details, so on this special occasion let him know how much you love him and express it to him through a nice greeting full of love. If you want to wish all the best to your boyfriend on the day of his birthday, then do it in a very original way. Send a nice note that will make him remember how much you love him and why he managed to conquer your heart. Up ahead we present two examples of phrases to greet your boyfriend for his birthday. Dedicate these beautiful texts to the man who won your heart and it will be a very special birthday for him. My love on this day specially, the day of your birthday, I have written this note because I would like to tell you how much I love you. You are my better half, by your side I feel complete. Every moment I live with you is wonderful because you make me feel your great love towards me. The time we have been together has made me see the wonderful side of life. Today the Lord is giving you another year of life and so it is an opportunity to continue our beautiful love story. This date is special because I will be able to share with you beautiful moments which we will keep forever in our hearts. You have taught me many good things and I feel very grateful to have you in my life. You are a lovely guy, I liked you from the first time I saw you. On this beautiful day of your birthday I want to wish you nothing but happiness and that you may see all of your dreams come true. May each of your days be filled with much joy. 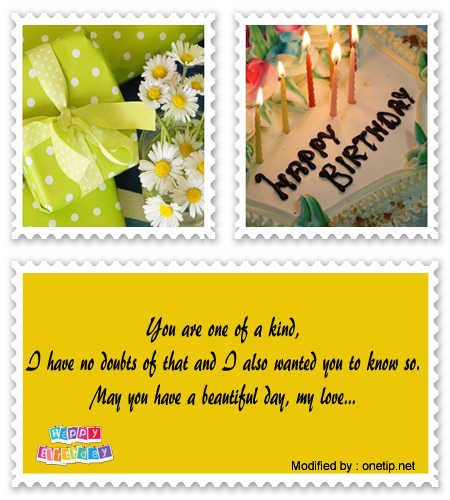 I know I have surprised with this note, it’s just that I wanted to greet you in a different way on this special day. You are the best thing that I have, thanks to you I feel that life is worth living fully every day and enjoying every moment. When I’m by your side it’s as if everything else disappears and there is just you and me. From you I have learned that love is true because you have taught me to love intensely and unconditionally. I am very glad that you came into my life at the right time and conquered my heart with each and every one of your beautiful details. I like being by your side because together we have fun and spend beautiful moments that remain engraved forever in my mind and in my heart. You are really are the best thing that has happened to me, if I didn’t have your love my life would have no meaning. As time passes I feel the great love that I have for you become more and more big. I did not know someone could love as much as I love you. Thank you for being you my love; you are the most important person in the world to me. 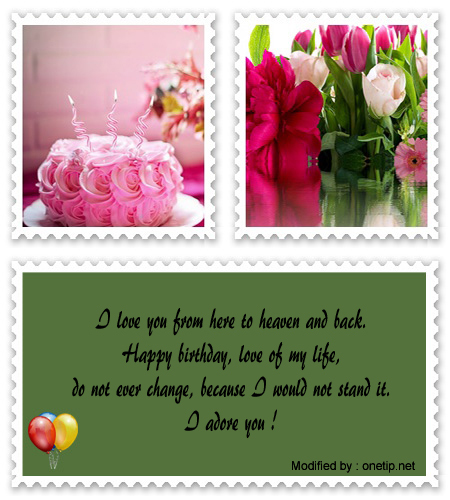 Have a beautiful birthday; I will do anything to see you happy today and forever. I love you with all my heart, I wish you much happiness and that all your dreams come true.